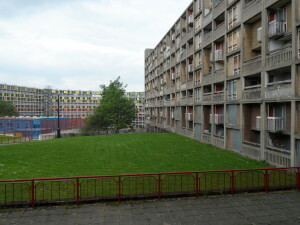 It’s been a long time since I blogged about Park Hill. In 2007 I wrote about the new plans. Way back in Feb 2009 I was hoping the then Council Leader Paul Scriven would be able to persuade the Government to bail you out so that the project could be completed. That’s more than 5 years ago. Since then we have seen the first phase completed and the first flats sold. 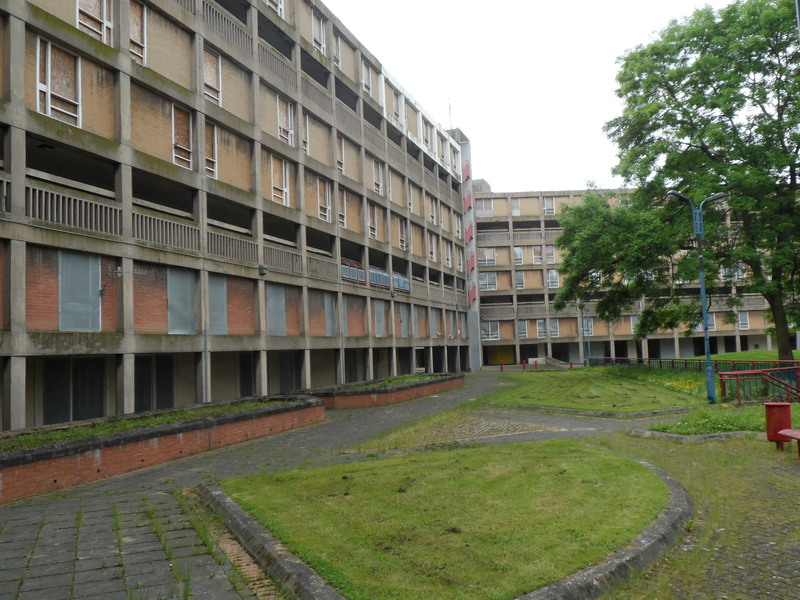 But progress is still agonisingly slow and the majority of the flats are continuing to deteriorate, looking ugly and unloved. You may have been nominated for the Stirling Prize but your lack of progress isn’t winning you friends among the local community. We can see progress being made in South Street park and welcome the new footpath that is currently being built. But there is no sign of the features that were promised to local residents such as the new local shops. Now the market has moved to the Moor and the FreeBee bus has been cut local residents are finding it increasingly difficult to get to and from the shops. When are the new Park Hill shops going to become a reality? Local residents have not joined in with the Liberal Democrats demand to demolish Park Hill. I think that it is important to breathe new life into the buildings. 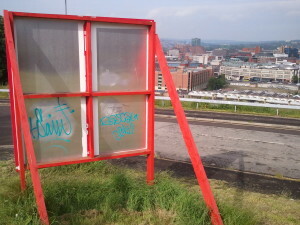 But residents are increasingly unhappy with the lack of progress and the deterioration of our local environment. The advertising hoardings here, are a good example of this malaise. 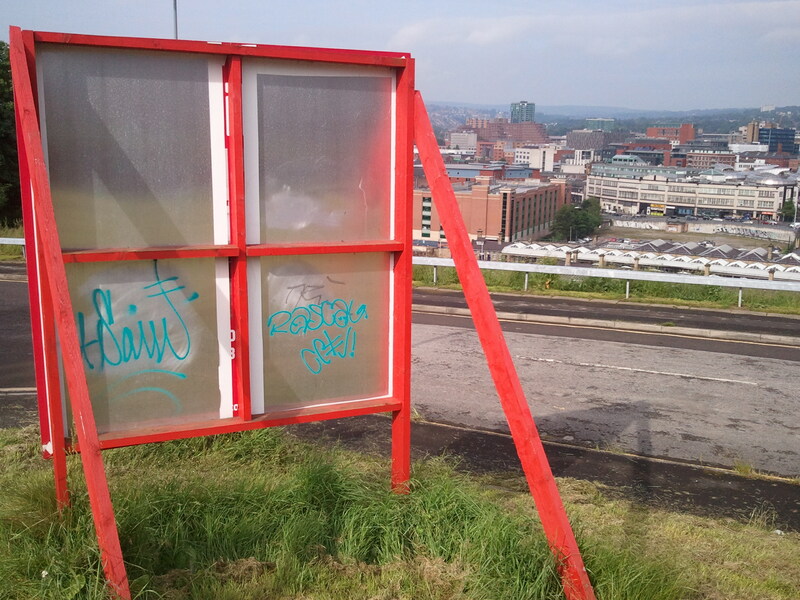 They have been graffitied on so much they no longer serve as an an advert for Urban Splash, they now shout out the message of urban decay. Surely you could find the pennies to renew them or at least remove them? The Government try to convince us that the recession is coming to an end. Park Hill has always provided affordable housing for the people of Sheffield. At a time when so many are homeless (over 1000 in 2011 according to this Freedom of Information request) it seems criminal that these flats have been empty for so long. 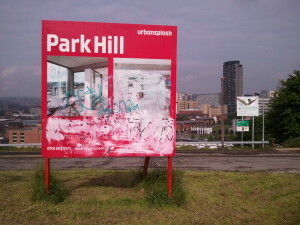 What are your plans now for the continued investment in Park Hill? Please explain to us when you expect each stage of the process to be complete. The Community Assembly used to be a good place for local residents to meet with you and discuss concerns and for you to explain your plans. It is a great shame these meetings no longer exist. 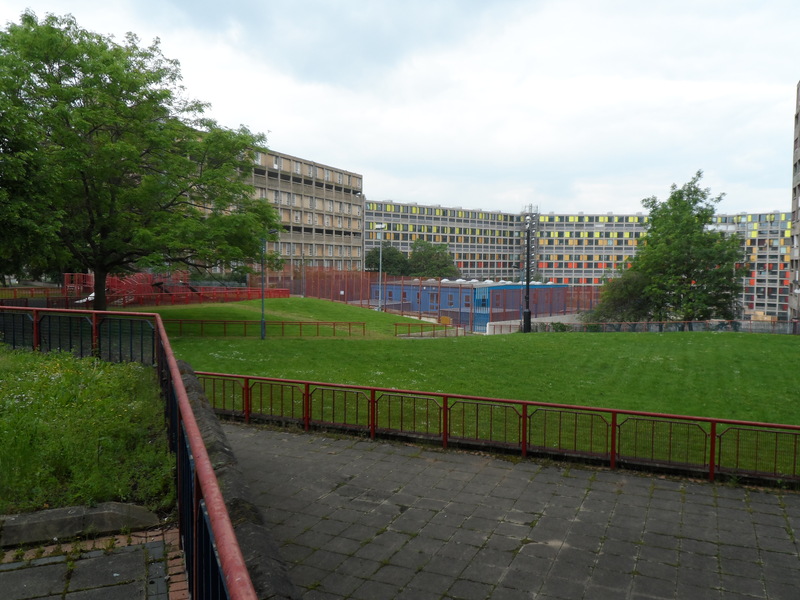 It would be a good idea for you to arrange a meeting involving Park Hill residents and neighbours, local busineses, Councillors and any other stakeholders.In the meantime I would be very happy to post your response on this website for local residents to read. It is now a fortnight since I wrote this letter and I have had no reply as yet.